A large body of our clinical cases confirms published data on success of endodontic treatment: «more than 60 percents of teeth demonstrate radiological indications of periodontal pathology in some time after successful therapy of root canals» (Weiger et al. // Endod Dent Traumatol. – 1997.– № 13.– P.69-74). Typically, the cause of such phenomena is the combination of objective (complicate anatomy of root canal system (RCS)) and subjective factors (lack of necessary knowledge, skills, equipment and so on). According to A. Castellucci «90 percents of endodontic treatment failures occur because of incomplete cleaning and obturation of RCS» (A. Casttellucci, 2006) (fig. 1). It was illustrated in the thesis of J. West, 1974: «…100 percents of endodontically-treated teeth extracted for periodontal reasons had at least one not obturated port from the RCS to the periodont» (fig. 2). 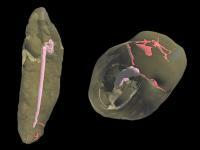 As evidenced by the above, thorough diagnostic examination (including a three-dimensional analysis of the original situation) becomes of particular importance. The previous doctor wasn’t able to path the root canal of 44 tooth (his conclusion was: obliteration). 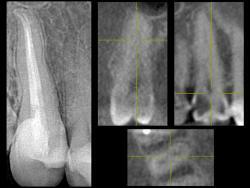 Root canal lumen in apical one half isn’t observed on the preoperative radiograph. 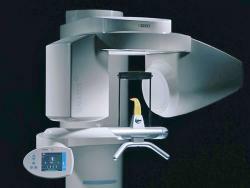 • The success of endodontic treatment strongly depends on the equipment and tools used by dentist. 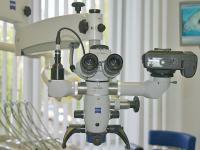 Application of operating microscope helps «to see what you are doing and to do what you are seeing». The bottom of the pulp chamber is located very deeply (fig. 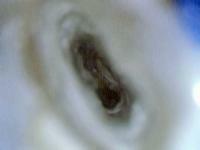 8) – 15-16 mm from the top of the cuspid! 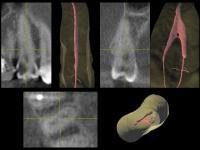 Root canals were obturated in the Schilder technique of vertical compaction of warm gutta-percha. Fig. 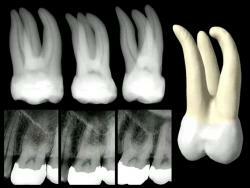 9 Postoperative radiographs of 44 tooth in different projections. • Success rate of RCT significantly increases with continuous approach in endo- and restorative therapy. Coronal part of 44 tooth was restored with the help of fiberglass point ENA-Post (HFO) and core material ENA-Cem (fig. 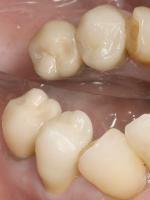 11-12), and was prepared for metal ceramic crown (fig. 13-14). The reason for treatment was the patient intention to make permanent metal ceramic crowns on 16 and 17 teeth (before the visit patient used plastic crowns). There were some complains of discomfort when chewing or touching the projection of MB apex (fig. 17-18). 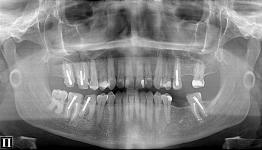 Anamnesis: 16 tooth had been endodontically retreated 2 years ago and obturated with Thermafil obturators at the same moment. Core was built with carbon post fixed in palatal root and composite core material. Tooth was prepared for metal ceramic crown. • Unfilled parts of canals in apical thirds of buccal canals. 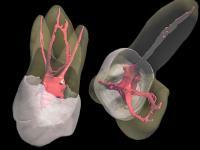 The decision about the second retreatment of 16 tooth has been made. According Simon Freedman prognosis for success of primary endodontic retreatment comes to 60-70 percents. While for the second one – only 30-40 percents. (Friedman, Shimon. 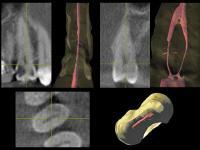 Evidence-based Management of Persistent Disease after Endodontic Treatment. – August, 2007. – Plenary report, 7-th congress IFEA, Vancouver, Canada). • The access to MB1 and DB was made. • Cores of Thermafil obturators were removed mechanically. • Then, mesial groove was inspected with Micro-Opener instrument in palatal direction. 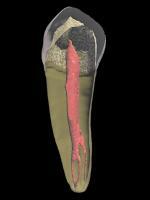 • After the withdrawal of dentin layer from medial wall of access MB2 orifice was found (fig. 29-32). • Buccal canals were cleaned and shaped with Protaper instruments with irrigation of 5 percent solution of NaOCl, patency of apical foramens was maintained (fig. 33-35). Unfortunately DB was not passed completely because of the ledge. 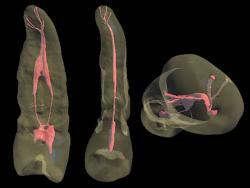 • Because of 3D study detected aproximal carious cavities affecting the coronal pulp of 15 tooth, endo-treatment is planned. Cleaning and shaping the RCS. Endo-restorative continuum for prevention the reinfection of RCS. • Removal of softened dentin (fig. 51-53). • Preparation of gingival walls with ultrasonic instruments (fig. 54). 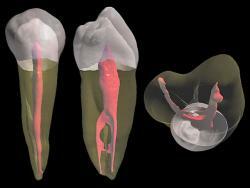 • Pretreatment – the restoration of aproximal walls of the tooth (fig. 55-56). • CT analysis. Horizontal slices at the orifice (one slit-like canal) and the middle (2 canals) levels (fig. 57-60). • RCT. 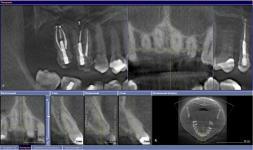 RC of 15 tooth were cleaned and shaped with ultrasonic and NiTi instruments (fig. 61). The possibility of RC fusion affects on obturation approach. 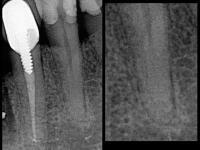 The master cone is fitted to one of root canals and the file #10 is inserted into the other canal on full working length (fig. 62 a-b). • Horizontal slice at the level between medial and apical portion (fig. 64-66): second fusion of RC. • Horizontal slice at the level of 2 mm from X-ray apex (fig. 67-68): second division of RC. • Below (fig. 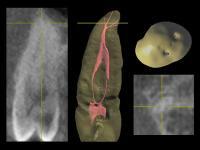 75-76) there are presented fragments of profile slices, showing fusion (orifice and apical third) and division (middle third and apex) of 15-th tooth’s RC, as well as an example of similar system from Dental Anatomy & Interactive 3-D Tooth ATLAS (Brown and Herbranson).